Kim's Kitchen Sink: 2010 Bracket Challenge! 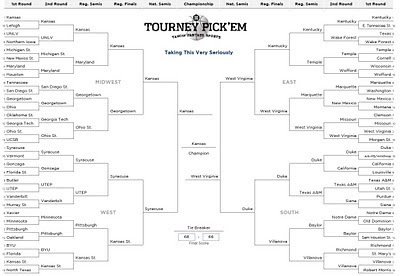 You may or may not remember that last year I wrote up a post detailing why and how I made my NCAA Bracket decisions. In case you don't remember, or weren't reading this blog at the time, here it is. I'm doing it again this year, and I'm even "running" my own little bracket through Southwest Airlines' Bracket Challenge, with a chance to win prizes and free flights and such. Because this post is going to be long, and because the fancy new Blogger editor lets me insert jump breaks, I've put the details of my picks below the jump. Enjoy if you want something totally silly to read. :-) Warning: it's long. But maybe entertaining. Perhaps. Kansas/Lehigh - I like that little Jayhawk, and they're favored 99-1 in user pics, so I pick Kansas. UNLV/Northen Iowa - UNLV are the Rebels, and Yahoo said this about them: "The antithesis of the run-n-gun Rebels of yesteryear, this year's UNLV club is controlled, slow and patient." I think that says it all. Michigan St./New Mexico St. - I pick the Spartans, because I was one in middle school, and because "if their ugly side appears, vacation comes early." Ok.
Maryland/Houston - I was going to choose Maryland over Houston because they are turtles, and then Yahoo said "Turtle power" and I was officially sold on them. Michigan St./Maryland - TURTLE POWER! Maryland/Kansas - Woody Woodpecker. I mean Jayhawks. Tennessee/San Diego State - "Slashers" vs. "Athletic Slashers" ... "Volunteers" vs. "Aztecs" ... I'm going with the Athletic Slasher Aztecs. Go San Diego State! Georgetown/Ohio - I'm going with Georgetown, simply because of this quote from their Yahoo description: "This is a team capable of advancing deep. Of course, in order for that to occur, taking care of the basketball must be stressed." Ya think? Georgetown/San Diego State - I pick Georgetown, just because. I didn't really think about it. Georgia Tech/Oklahoma State - "Unless Tech shackles the orange, it will be Ramblin' Wrecked early." - What does that even mean? Whatever, I pick Tech, because they are favored higher, and because they are the Yellow Jackets, and those bugs don't mess around. Ohio State/UCSB - Even though I like the fact that UCSB is the Gauchos (and my mom went there), I can't ignore the Buckeyes' chances at the Final Four. So, Ohio State. Georgia Tech/Ohio State - hmmm Buckeyes just look better according to stats I don't really understand or pay attention to. Georgetown/Ohio State - I pick Georgetown because the teams are sort of evenly matched (I think), and Georgetown is a slight underdog. And hey, they just need to take care of the basketball, right? Kansas/Georgetown - I'm sticking with Kansas on this one...good old Woody Woodpecker. Jayhawk. Kentucky/E Tennesee St - "Ashley Judd, rightfully so, is giddy." Ok, I'll bite. I pick Kentucky. Even though "rolling through the Atlantic Sun tournament, the Pirates hope to plunder Daddy Warbucks for the fourth time in seven years." Texas/Wake Forest - I'll go with the Deamon Deacons this year, since I didn't pick them last year. Kentucky/Wake Forest - I pick Kentucky because of Ashley Judd's apparent giddiness. Temple/Cornell - "Nocturnal these Owls are not" - so I pick Temple. Wisconsin/Wofford - Wofford? Wofford? Really? There is a school called Wofford? Even though the Wisconsin Badgers have a "grinding, systematic style", I'm going with the Wofford Terriers, who can be expected "to leave teeth marks in a favorite's backside". Tee hee. Temple/Wofford - I am going with the owls because they are not nocturnal! Those crazy owls! Kentucky/Temple - Giddy Ashley Judd wins over Not Nocturnal Owls. Sorry, Temple. I pick Kentucky. Marquette/Washington - Marquette all the way. I can't root for the Huskies because the boyfriend's brother is a Cougar (and they are sworn enemies)...but also, Marquette's description says "Don't sleep on them." Whatever that means. New Mexico/Montana - I'll choose the New Mexico Lobos, because Lobos is funny to say. And they're favored 97/3. Marquette/New Mexico - I'm not going to sleep on Marquette. I hope they win. Clemson/Missouri - These both look pretty lame, so I'll choose Mizzou, because I like the silly name. West Virginia/Morgan St - West Virginia, because of this: "The Mountaineers aren't exactly Baryshnikov on wood..." They may not be Bayshnikov on wood, but they had me at the ballet reference. Missouri/West Virginia - Mountaineers all the way. See above. Kentucky/West Virginia - this is tricky. a giddy Ashley Judd vs. (not) Baryshnikov. Hmmm I'll go West Virginia because they are kinda the underdogs in this unlikely matchup. Syracuse/Vermont - Syracuse is "The Orange", and even though supposedly they enter the ring with "lower pulp levels" (oh Yahoo, you are so punny), I'm choosing them. Along with 99% of the users so far. Gonzaga/Florida St - I choose Gonzaga because it's in Washington, and I've heard of it. Syracuse/Gonzaga - Syracuse is favored to win...Even though I think a bulldog would devour an orange, I'm going to go with the majority on this one (and feel really silly if there is a crazy upset). Butler/UTEP - I don't know what UTEP is, but they are the miners, and they have their pickaxes sharpened! Vanderbilt/Murray State - Murray State used the Seabiscuit thing last year...so Vanderbilt it is. UTEP/Vanderbilt - The intern at work said "definitely the miners" in this matchup. So...yeah. Miners it is, even though they are the underdog. Syracuse/UTEP - Syracuse. Because the boyfriend says they are really good. Xavier/Minnesota - Even though Xavier reminds me of Rufus Xavier Sasparilla, I have to go with the Gophs. Pittsburgh/Oakland - I like Pittsburgh for this one. They are highly favored, and I like panthers. Minnesota/Pittsburgh - Now this one is tricky. A panther could certainly take down a gopher, but gophers are so cute. I'm really struggling with this decision, but I think I have to go with Pittsburgh...if this matchup actually happens (which it probably won't), they're more likely to actually win. BYU/Florida - I don't care about either team, so, um, BYU. Because I'd like to see the Mormons party it up. Kansas St/North Texas - There's a North Texas? Kansas State are the Wildcats (High School Musical, anyone? ), but North Texas is "Mean Green" ...but alas, North Texas seems to be not so good, so Kansas St it is. BYU/Kansas St - Kansas State looks like a good team (I think), so I predict they will win. Syracuse/Kansas State - Syracuse...I somehow think they're going to do really well throughout this tournament. Kansas/Syracuse - Well, I've gotta go with the Jayhawks here. Haven't seen 'em in a while (in my bracket), and I like that little bird. Duke/Ark-PB/Winthrop - Duke wins because Ark-PB/Winthrop has nothing in its description stats-wise, and a really confusing description and I don't know who they are. Cal/Louisville - I pick Cal, just for the sake of picking Cal, even though Louisville is favored. Duke/Cal - I pick Duke, because they are, um, how should I put this...better. Sorry, Bears. Texas A&M/Utah State - Texas' freethrows "can be a bugaboo", but I'm gonna pick 'em anyway. Wait, is a bugaboo a good thing? I have no idea. Purdue/Siena - Like I did last year, I'm picking Siena because of my adorable pseudo-niece Sienna. Texas A&M/Siena - Goin' with Texas A&M...they seem like a better team. Duke/Texas A - Duke it is. I think they will do well. Notre Dame/Old Dominion - Old Dominion? There's really a school called Old Dominion (Old Dome for short)? Notre Dame is my pick. Because I've heard of them and they seem respectable, despite their "occasionally horrific defense". Baylor/Sam Houston St. - No contest...Baylor. I've heard of them (in regards to basketball) and I've never heard of Sam Houston State. Done. Notre Dame/Baylor - Baylor. They have a dude named Epke. Richmond/St. Mary's - Ummm...Spiders vs. Gaels...ummmm Spiders I guess? Villanova/Robert Morris - Villanova. Isn't Robert Morris a talent agency? Ok, that's William Morris. But still. Richmond/Villanova - Villanova. Kill those spiders. Baylor/Villanova - Villanova. I don't honestly think they'll make it this far, but if they do, I think they'd win this match. Duke/Villanova - Duke. I actually think they will make it this far. West Virginia/Duke - hmmm I want to say West Virginia here. Did you actually read this whole thing? Wow. Ok, you get a prize. This awesome video.